Favorite place: Since I just moved here I don’t quite have a favorite place yet, but I can’t wait to continue exploring! I am pursuing the M.S. in Management, as it will be an excellent compliment to my undergraduate degree in Psychology. Together, they will allow me to develop as a well-rounded business professional. I recognized how highly regarded UNC Charlotte is for all of its programs, and when I learned that the M.S. in Management program was being introduced for the first time, and that it offered an exceptionally diverse range of courses in a accelerated 10.5 month program, I knew that this is exactly what I wanted to do. What can you share about your experience so far being an Ambassador, and what do you hope to accomplish this year in your role? I am honored to have the role as the M.S. 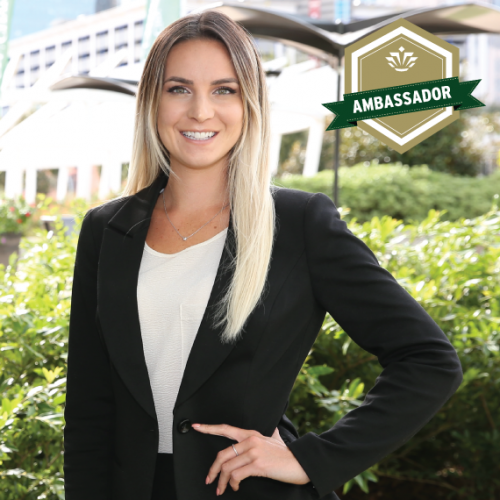 in Management Marketing Ambassador, as it allows me the opportunity to share my passion for the program with the community. I look forward to attending many events throughout the year so that I can continue to share my experiences with others. I never believed that any program could stimulate such a higher level of understanding of a variety of concepts and principles. This has made the learning process extremely engaging and rewarding. It is thrilling to know that by applying these varying degrees of competences gained throughout the program this will result in me becoming highly skilled in management and ready to take on the business world. Exceptional. The Belk College of Business provides such an immense amount of care and consideration for their students and it is lead by an exceptional faculty who want to see all of their students excel to their full potential. The faculty is fully dedicated to providing students with a learning experience of a lifetime, and is willing to go to great lengths to assist the students in any way they can. Being an international student, the faculty for the Belk College made my transition into, not only a new school, but also a new country, a welcoming and comfortable experience. The faculty was excellent in helping me settle in and made sure I was equipped with everything I needed to get started with the program. I could not have asked for a more positive experience, and I feel so privileged to have the opportunity to be surrounded by so much talent. I truly look forward to all that the M.S. in Management program has to offer and to utilize the unique knowledge gained to excel in my future career.